Kate, Brooks, Hayley, Adam, Polly, Andrew – and your wonderful families – I’m confident you have received many expressions of thanks through the years for so much that each of you and all of you together have been and done at St. Mark’s and in this beautiful Santa Ynez Valley. You are “doers” and here that means everything from leadership, formal and informal, serving as Wardens and taking out the trash, organizing Christian formation and pruning roses, chairing the building committee and setting up chairs, and the list goes on and on… and on… over decades, since the 1970s. Most of all you’ve shown, by example, that nothing happens here unless motivated, enthusiastic, generous individuals commit spiritually and give their time, intelligence, creativity, good humor, physical labor, and material resources in response to God’s call. You’ve shown that when multi-faceted commitment goes into action, great things happen that benefit many friends and strangers, young and old. While it has been discussed on and off for years, today, Idabelle’s baptismal day, marking the advent of a new generation, seemed an opportune time to create a lasting tribute in gratitude to God and to all of you by dedicating and naming this building Firestone Hall, after your whole family of families, which the Vestry has unanimously done. 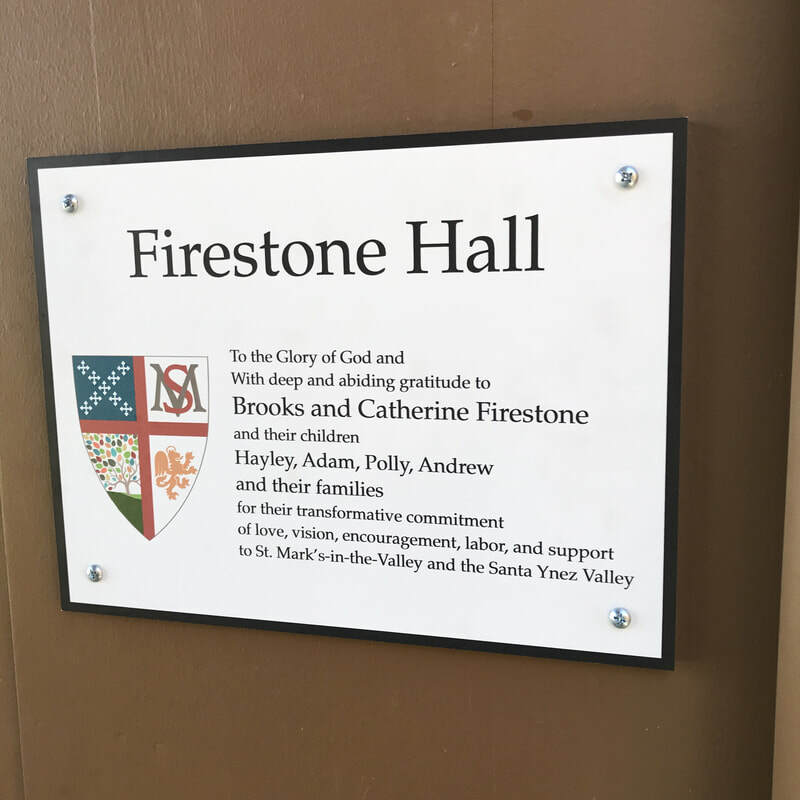 This recognizes not only all that all of you have done at St. Mark’s but also your similarly vast contributions to the wider Santa Ynez Valley region. And while this may not be an expression that you need to receive, it is certainly an expression that St. Mark’s, as a parish faith community needs to make.